The most indulgent bun we have ever made. Our favorite! This recipe is a variation on the cinnamon bun recipe. It is hard to choose which one we prefer. The combination of good quality cherries and real almond flavor in the pastry cream is heavenly. These buns make us smile as soon as we bite into them! For the dough we use French type 45 flour which works really well if you like your buns to be light and fluffy. We love to use fresh yeast for these buns, the smell of the proofing dough is a treat in itself. As a final touch we add a vanilla sugar glaze on top for an extra hint of sweetness. We apply a very thin, almost translucent layer. It also gives the buns some extra texture to bite into before you reach the softness and creaminess of the bun. You can prepare the pastry cream in advance so it will be ready the next morning. You can find our favorite recipe for pastry cream here. We added 1 tsp of our real almond extract to the cream and left out the vanilla. In the bowl of a standing mixer combine flour, salt, yeast, water, milk (if you use fresh yeast first dissolve it in some of the water, instant yeast can be added straight to the flour), butter, and sugar and knead for 7 minutes. Kneading by hand will take about 15 minutes, depending on your technique. The dough should be silky and bouncy. Leave to rest for 1 hour at room temperature. With a pastry roller roll out the dough to a rectangle of about 60 x 50 cm / 23 x 20 inches. Take the prepared almond pastry cream from the fridge and give it a good beating with a whisk to loosen it and spread an even layer onto the dough rectangle. Sprinkle the cherries on top. Roll up the dough (the long, 60 cm side facing you and then roll away from you) and cut it into 4 cm / 1.6 inch size rolls (15 in total) and place them, cut side up, in a nonstick or greased baking pan (the one we use in the picture is 30 x 40 cm / 11.8 x 15.7 inches). Leave to proof for 60 to 75 minutes. Preheat your oven at 200 ºC / 392 ºF or around 190 ºC/ 375 ºF convection oven. We find the convection setting works best for us with this recipe. Sprinkle on the slivered almonds and bake the proofed buns in the oven for 22 to 25 minutes (depending on your oven of course). Leave to cool slightly. Prepare the glaze by mixing icing sugar, vanilla and water to form a smooth paste and brush on top of the buns. You can add lemon juice or other flavors to the glaze if you want to. Optionally you can prepare the dough the evening before baking day, however for this you need to add 2 g instant or 6 g fresh yeast to the dough instead of the full amount. Leave the dough after kneading to develop for 10 to 12 hours at cool room temperature. You can roll out the dough the next morning and continue from there. I’m from Ghana. I honestly do not know where I can get French flour type 45. Kindly suggest a substitute or can I use a mixture of cake and bread flour. That is so wonderful to hear. Sweet bakery memories. We recently visited the area of ‘s-Heerenberg, it is a very nice, green part of Holland, not so typically flat. We liked it a lot. A lot of our travel and holiday memories are related to food and baked goods and visits to bakeries. The best! Love the idea of the coconut too. Glad the recipe is to your liking. I plan to try these because the pastry cream idea intrigues me. I have made a lot of cinnamon rolls for large groups in advance of the time desired by rolling and cutting them and then putting them in the baking pan and covering with plastic film and refrigerating (about 37F) overnight. The next day, when the crowd gathers, I bake them off about an hour before hand and they are still a little warm when eaten. This last rise works fine and I think gives a better flavor because of the slow rise. I am not sure if the pastry cream will interfere with that last rise or if it will compromise the dough, but I will let you know. I am so glad I found your site. My mother was born in Overveen (nee Bijvoet), grandmother was from Schiedam, and I have relations that I don’t know very well in the Netherlands to this day. Thank you for your comment. So nice to hear about the Dutch roots of your family. We have lived for quite some years in Haarlem, which is very close to Overveen. It is a lovely area. We have not tried your method with these buns, but we think it will be fine. We would love to hear about your results with this recipe. Good luck with all your baking activities. These look wonderful, two questions: can I replace dried cherries by fresh cranberries? And should I reduce the amount of fluids. next: can these be frozen regarding the pastry cream? Happy holidays and until 2015! Hello Petra, we do not think you need to change the amount of fluids within the dough. However there is a taste difference between fresh and dried. The dried ones will behave like raisins and stay whole, but the fresh cranberries will probably turn a bit jam like. We freeze these buns all the time as we can not eat them all in one go. We blast them on high power in the micro wave directly from the freezer to slightly warm so they taste almost like fresh again! Happy baking! This recipe looks great! 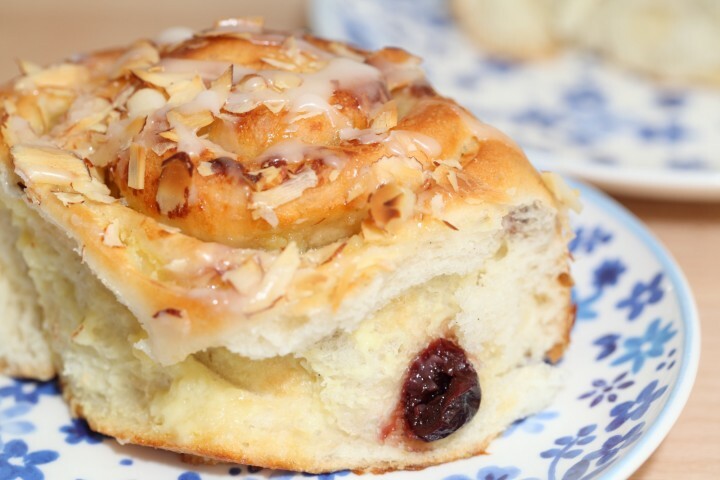 I would love to make this buns, but where can I buy the dried cherries, here in the Netherlands? They are also wonderful to eat as a snack. This is a great recipe! I made this for some friends I was visiting and it was a great success! I substituted the cherries for fresh blueberries (which are in season here in Australia) and forgot to change the vanilla for almond in the crème patisserie and the end result was delicious. I tried the method of making the day before which worked out very well. This was my first attempt at a crème patisserie and I had no problems. I’m looking forward to making some more! Thank you for all your great recipes – I’ve tried a few now and they always work! Hi Selina, great to hear. We often play around with the ingredients, you can change the fruit with the seasons, the flavoring and still use this recipe as a guide line. With xmas we will be using cinnamon flavored crème patisserie and perhaps add some cranberries! Happy baking! We really love the taste of the almond, cherries and creme pat. It is heaven. The creme pat is very thick, when hold the bowl upside down it should not run out of the bowl. This way it stays really nice within the buns. Give it a try you will like it, there is no substitute for home made creme pat with eggs and butter! Happy baking!